As part of the new series "It's a New Day" at our church we have been looking at all that comes in being a new creation in Christ Jesus. Old things are gone and new things have come. 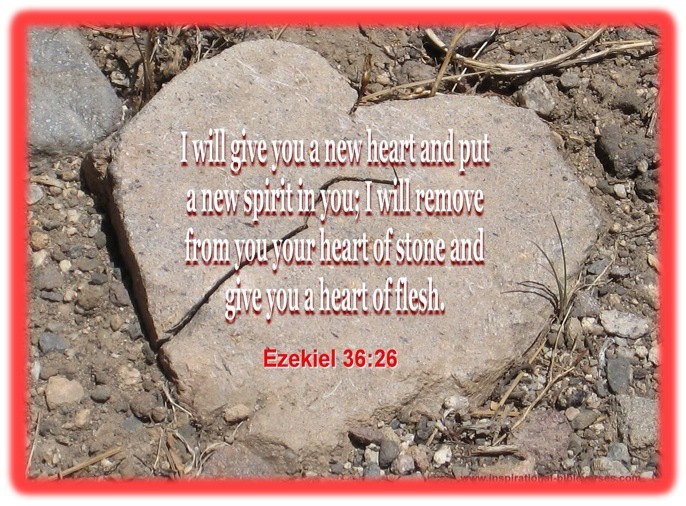 One of those new items is found in Ezekiel 36:26 where it tells us of God's desire to give us a new heart. The heart has its own rhythm and agenda before we surrender it to Him. Your heart is not naturally tilted in the direction of God. It beats to a different drummer until you are “born again”. Once you have received Christ as your Lord and Savior he gives you a new heart. The heart of stone becomes a heart of flesh...pliable…manageable…shape-able. When you ask Jesus to be Lord you are asking Him to come and live in your heart and to rule and reign in your life and He cannot move into a defiled, wicked heart. So he gives you a new one. And it is out of this new heart that springs hope, faith and love. Now this incredible new heart is able to be filled with amazing new things from God…desires…His desires for you…hope and a future…an incredibly abundant life. Life is beating in you so life comes from you and all those that are connected to you see and feel that life. In it(heart) lies life’s treasure-where your treasure is…there your heart will be also. The most important decision you will make in your life is to determine who gets your heart. When you give it to Jesus, you find that all good things start working together for you...your circle of influence changes...your unique talents surface...and your hope comes alive.So let go of the control today and let God give YOU a new heart!